book review: This is Your Life, Harriet Chance! This is Your Life, Harriett Chance! By Jonathan Evison. Dazzling quick read. Harriet Chance, a jagged edged and flawed woman [who wants to read about perfection? ], finds out surprising news after her husband’s death. She takes the Alaskan cruise her husband paid for and planned with her daughter as an unexpected and rather undesirable travel companion. Of her daughter: “It breaks Harriet’s heart that Caroline squandered every opportunity, that she sabotaged her life with bad decisions.” I haven’t read that many authors that memorably chronicle old age or convincingly can write an older character. Muriel Spark [Memento Mori] comes to mind. It’s impressive that Jonathan Evison deftly gets into the mindset of a 78-year-old female character. Evison brings Harriet Chance to the reader during various ages in her life with candor and wit. Using a game show voice the narrator takes Harriet Chance back and forth from present to past to describe what occurred during her lifetime. The paths she chose. The paths she didn’t. The results. It’s about parenting and partnering and navigating life’s messiness and pitfalls. The edgy tone makes this novel superbly inventive, unique and fast-paced. Of Harriet Chance in her 20s: “All these years later, they’re still slapping your fanny around the office. Your salary doesn’t stretch that far. The work is exhausting. As both a woman and an assistant, you’re expected to work harder.” I like Harriet Chance in her early years– a scrappy survivor with realistic expectations. By 78, Harriet’s rather resigned yet remains unapologetic and opinionated. Can she and her daughter come to terms with each other now? This is a delightful, brutally honest novel that will keep you turning pages. purchase copy here: This Is Your Life, Harriet Chance! 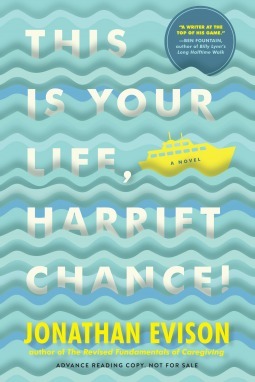 Algonquin Books, Jonathan Evison, This is Your Life Harriet Chance!